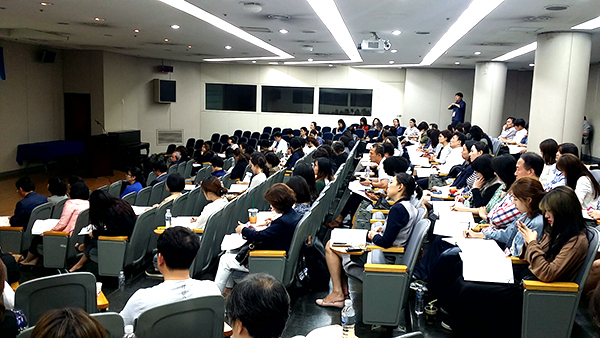 Ewha Institute for Age Integration Research Holds the First International Symposium, Titled "Age Integration and Intergenerational Relationships"
Korea is currently facing a trend of population aging that is unprecedented across the world. As the challenges stemming from population aging are not limited to older generations in this new aging era of our society, it is of utmost significance to identify solutions to resolve such intergenerational problems. 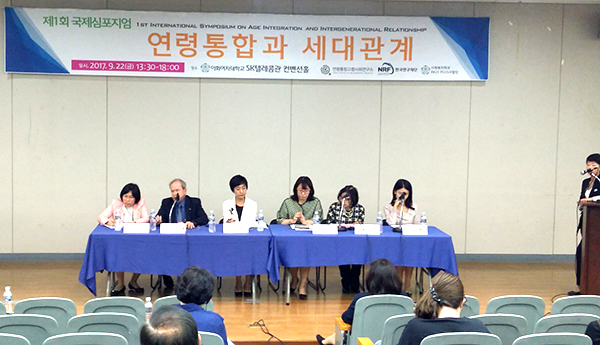 In this regard, the Ewha Institute for Age Integration Research (Director Chung Soondool) held an international symposium under the theme, “Age integration and intergenerational relationships,” at the conference hall in the Ewha-SK Telecom Center of Ewha Womans University on September 22, 2017. The institute, which has served as a hub for age integration for the past seven years, provided an opportunity to cast new light on the meaning of age integration as a new paradigm for establishing the principles of social composition in the aging society, and to seek alternative theories and policies in collaboration with the world’s most renowned scholars to ensure that people of all ages are able to live happily together in the aging society. 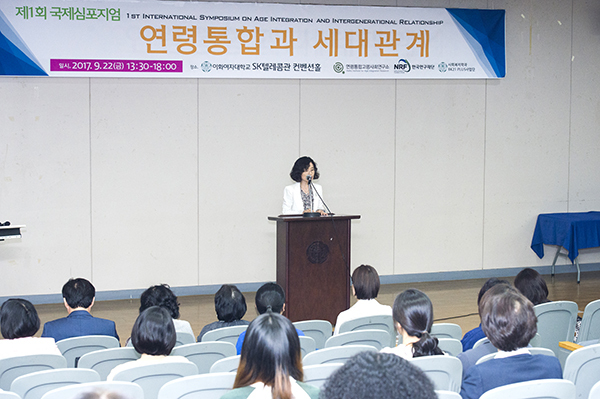 Starting with an opening speech by Director Chung Soondool of the Ewha Institute for Age Integration Research and a congratulatory speech by Director Choi Eunbong of the Ewha Institute for Social Sciences, the symposium consisted of two sessions held from 2 to 6 p.m. In the first session, Director Chung made a presentation titled “Age Integration: Why Is It Necessary and How Can It Be Done?” as a comprehensive look at the concepts and meanings of age integration, on behalf of Prof. Martin Kohli of the European University Institute. 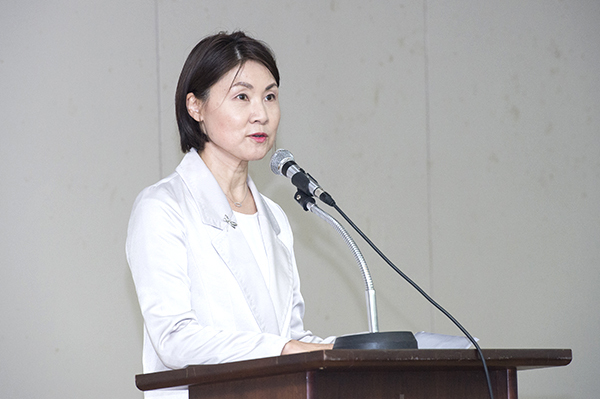 Under the title of “Development and Application of the Age Integration Indicator (AII),” Jeong Kyung-hee, the head of the Population Policy Research Department of the Korea Institute for Health and Social Affairs, introduced a study describing the necessity of the development of AII in a format best suited for Korean society and an international comparison using AIIs. 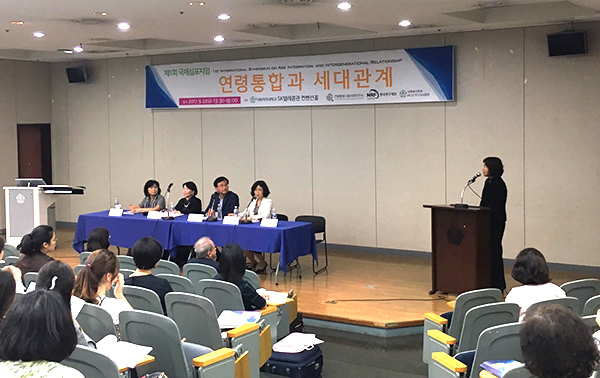 During the first session, Prof. Choi Youseok of Hallym University and Prof. Han Gyoung Hae of Seoul National University served as the debate participants. The first session was made all the more meaningful by examining both theoretical and policy perspectives on how various parts of our society, such as education, employment, social participation, wages and culture, will move forward in light of age integration. In the second session, Prof. David Chiriboga of the University of South Florida discussed the research on intergenerational caregiving in the U.S. in a presentation titled “Family Caregiving and Intergenerational Relationship,” and Prof. Yoko Hosoe of Jissen Women's University examined attitudes among Korean and Japanese college students toward elderly people in her presentation, “Images of Aging and Intergenerational Relationship.” By exploring international examples and comparing them with Korean society, these presentations provided a meaningful chance to consider the means and alternatives to promote intergenerational interactions in consideration of the idiosyncrasies of our society. In addition, the discussion between Prof. Lee Mi Jin of Konkuk University and Prof. Han Jung-ran of Hanseo University highlighted the significance and meanings of intergenerational interactions alongside the audience. 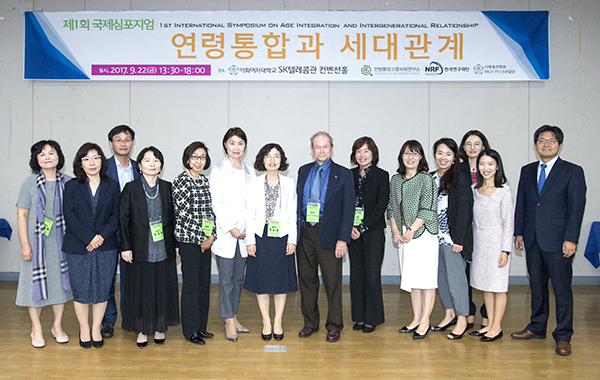 ​This international symposium examined various aspects of social systems and intergenerational interactions including education, families and local communities in terms of age integration, and contributed to seeking theoretical and policy alternatives to allow those of all ages to live together in the aging society.